It has been my experience putting together a photo shoot it's not as easy as it seems. I have been part of many of many shoots. The one's I did not plan and coordinate seem to go badly for me and the other folks involved. I want to go through a few steps that have helped me to ensure an effective shoot. During the planning stages, be clear on what you want to achieve, what is the feel and looks? Pick the clothes you will be showcasing. Will it be Indoors or Outdoor? If Indoor, get the studio or location confirmed. If it's outdoors have a plan B, nature can play tricks on you and some other issues can arise. Also outdoor decide if it's early or late in the day. If its broad daylight make sure you have all your equipment, reflectors, etc. 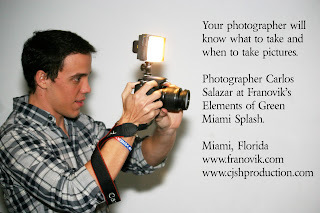 Your photographer will know what to take and when to take pictures. Speaking about photographers, decide who your photographer is going to be. Depending on who they are some could be more experienced with editorials versus runway, some specialize or prefer In (studio) or Outdoor (elements). Photographers should have back up cameras, batteries, lights and any other items they need to do their job. I normally have a long conversation with them for various reasons, First, I need to convey my ideas and secondly, I want their input; they are artists just like myself plus their years of experience is valuable to be as a designer-stylist of my company. Next your hair and make-up artists, just as the photographer, connect with these very essential people. They can make you or break you. Sit and discuss your vision and ask if they can accommodate your vision creating the looks you need. I also want their input; I am not a hair and make-up artist, although sometimes I have had too because the artist have not shown up. Your models are the most important element of the shoot. Go through your models and see who will be the right one for the shoot. Have a few models at the shoot and also back up models should something happen, we are human. While one is shooting, work on the others so there is no downtime. Remember TIME IS MONEY but you should have breaks between shoots. By the way, No one gets paid until the job is done. Every photo shoot, you should have a back up photographer, hair & make-up artist, and models, just in case. Always think of your models and staff, have beverages and food, most, if not all shoots run all day. On the subject of food, think light, small sandwiches, fruits, snacks, water, juices, coffee or tea or both. Forget heavy meals (carbs), sodas, it's a shoot; they have to be lean and light on their feet. Once all of these things have been done, then comes the fun part, bring everyone in. Since I am "The DO IT ALL", I become Santa and make a check list and check it twice before the day begins. On my shoots, I expect everyone to be on time. If you are traveling to the shoot allow extra time. It’s better to be half an hour early than five minutes late, so allow for delays, (that's why I always invite more models). Remember extra time gives you chance to relax after traveling, and to prepare yourself prior to hair and makeup. It's good practice to introduce yourself to the photographer with no pressure to start working immediately. When you meet the photographer, make-up artist, or other models it’s really important to greet them with a friendly smile, eye contact, and possibly a handshake or a kiss. When you are shooting it’s important to put all your effort into your work. It’s your job, and you’re lucky to be doing something you enjoy, so be grateful and make sure you offer the photographer value for money in the form of effort and involvement. Take direction and make suggestions. Be patient, be polite, and work with the photographer to make sure he gets the images he wants for himself or client. I like to play music during my shoots, silences can become long and awkward, and this might affect the quality of the pictures, I like to have fun at my shoots. I don't like posey posey, I like my shoots to be active (walk, jump, spin, sing) yes sing. I have found that lip-syncing is awesome for picture taking. Some of my best shoots have been when the photographer, models and I have a laughed all the way through. Models have to be engaged, you see they also get pictures so it's in their best interest to put 100% of them in the shots. Time flies when you are having fun, don’t be afraid to suggest and play with ideas and poses. The photographer might not have thought if it, and will be grateful for your input. In my shoots, I like people to participate we all learn from each other.